AI is going to disrupt Marketing by 2020 with more advancement in technology. A lot of companies have already adopted AI for company growth and development. Which is going to grow exponentially as the technology is advancing. And AI is just a baby comparing to what it will ten years from now. It will dominate the digital marketing space, the offline marketing space still may have some human touch. A research done by Gartner in 2016 shows that by 2020, at least 30% of companies globally will use AI in at least one fragment of their sales processes. If we look at the present scenario even today, chatbots are everywhere. Chatbots which are now just chatting with few yes-no answers, they will converse with human-like talk. 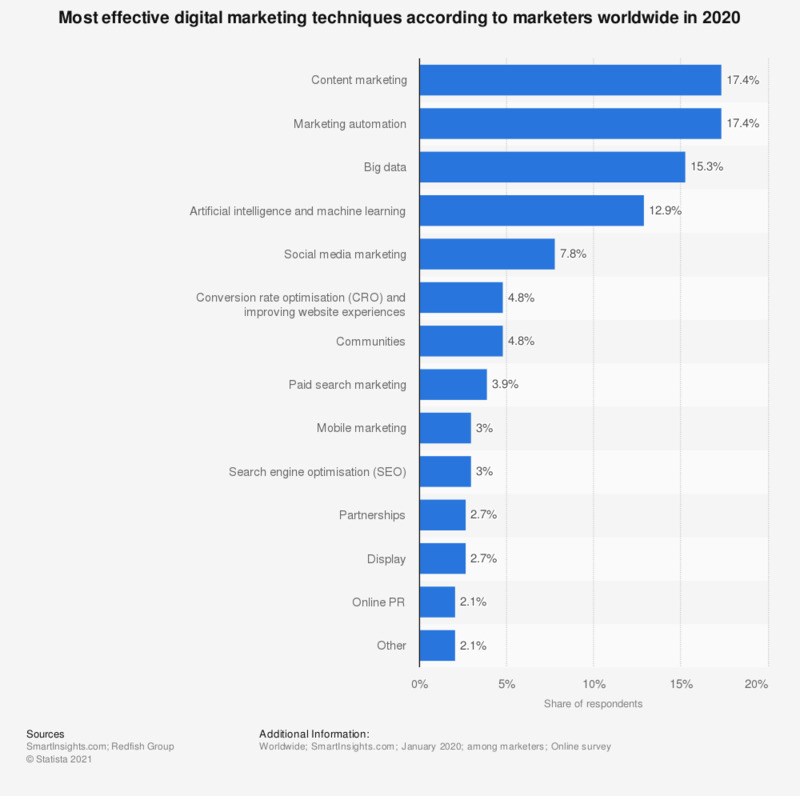 Statistical analysis was done by Statista in 2018 on “digital marketing techniques used by marketers” shows about 14% of Marketers agreed AI is most effective in Digital Marketing. It is also predicted that AI will be so powerful in coming years that 30% of new cars will have a self-driving mode by 2020. A lot of predictions and hope for AI in coming years. It is hard to tell how AI will change every industry. But, the Traditional way of Marketing is going to change for forever. Product pricing is going to change for forever. The traditional way of pricing the product according to the companies interest will change. Now Products will be priced according to the customers need, and this will be done by understanding the customer psychological behaviors. AI will be able to do a retrospective analysis of consumer’s purchase history, behavior, and choices, and Statistical analysis to determine the price according to the market changes. Companies may surprise you with a renewal price drop of service watching your purchase history to retain you, and before you hit on another company. The use of heat maps has given a lot more insights about consumer behavior on the website than before. With AI it will not be just limited to heatmaps. AI will read Consumer Psychology and will help from product design to product pricing. It will not be just limited to the online world. Tracking the user behavior using sensors in physical stores will be fun to watch in future. With sentiment analysis, companies can understand the emotion behind a text by analyzing it. This technique can be used to study the communication regarding a brand on social media platforms, blogs and review sites to understand the collective market opinion towards it. A Chatbot is a great advancement in this regard. An AI Chatbot can collect all the data conversed with the customer from chat history and interpret the emotions of the customer from the data collected. Thereby, offering the customers only products which they like. In this era of hyper-personalization, your email subscribers likely only pay heed to emails that speak to them directly (and ignore the rest ). That’s why the key to great email marketing today is sending tailor-made content to the right people at the right time. The way email marketing is done at present is going to change a lot in 2020. Sending tailor-made product and service recommendation emails to your subscribers has been shown to boost customer loyalty and improve engagement and conversion. AI can automatically track purchase and browsing behavior, interest levels, and online activity to create personalized product recommendations in the body of emails in real-time. This saves marketers the time from having to hand-pick products for their subscribers or a drop in engagement as a result of promoting the wrong products or offers. AI can help you determine which content and images will be most effective in welcome emails, cart recovery emails, order update emails, and retention emails to drive the greatest amount of engagement and conversion possible. AI-powered chatbots are an amazing way to carry on communication with customers and provide them with support. Personalized Customer Service is being offered everywhere right now around us. If you open your favorite music app on your phone, you will see playlists with personalized music. This thing is not just limited to music. In every industry fashion, food, finance, entertainment companies taking personalized service as their main goals. And most importantly it is saving companies money, AI making it easier for companies to give a personalized touch to customers with less human involvement. Thus, money saved! Content Marketing is going to change a lot due to the advancement in AI. The way video and blog contents are shared right now will change. Right now contents are created at one source and shared through social media or Search Engine. By 2020, contents will be automated which will be interest based and particular for a particular person. There is a big chance that the traditional Content delivery systems like TV, Radio could not be able to survive. Establishing a brand connection with a consumer (especially if you’re a fashion brand, for example) will be entirely transformed by visual technology. Similarly, Visual AI has an influence in the travel industry too. Every good marketer knows that personalized visual content is the most powerful tool for engaging, converting and retaining customers. Within the travel and tourism industry, visual content is a company’s most effective influencer, inspiring viewers to move from dreaming about travel to actually visiting a destination by allowing them to picture themselves in the locations being advertised. According to Search Engine Land AI can make difference in SEO performance through Insights, Automation and Personalization. Insights: Artificial intelligence can process and interpret patterns from a heap of noisy, unstructured data which is next to impossible for a human to do manually. As AI can give us more insights from that heap of data than just traditional SERP which will help as Ranking factor. Automation: SEO is not that easy, it takes time for Keyword research, Content optimization, Content distribution and same these things can be automated using the power of AI. Personalization: Content discovery is no longer limited to the search results page, so marketers must truly understand their consumers to ensure they can engage with them, anywhere and at any time. There is no doubt that in this long run of AI vs. Human SEO, AI is going to win. Amazon and Apple are already using AI in their marketing endeavors, helping customers through their voice assistants Alexa and Siri respectively. Nearly half of U.S. adults (46%) said they now use these applications to interact with smartphones and other devices. This number is going to grow by 2020 with advancement in Voice Search. Voice Search is going to be more accurate with improved voice recognition. AI will develop a human like bond with one to one personalization. They will wish you on your birthday, will make decisions for you what you will tonight and what not. The real fear is automated content for publishers like us. It is obvious that AI is still in nascent stage to beat a human writer in coming two to three years. But if we think of a span of 10 to 20 years in future when AI will be in the adult stage, automated content generation will shut writer’s job. Text content creator are going to affect more than video and other forms of creators. Eventually, everything seems to be possible as for today we can see it is possible to manipulate videos with Deepfake. The Washington Post’s AI writer (Heliograf) wrote more than 850 stories during the Rio Olympics and the 2016 US presidential election. Heliograf will free up Post reporters and editors to add analysis, color from the scene and real insight to stories in ways only they can. 2020 is way early for AI to show its full potential. It will grow on successive years as more and more data is collected and analyzed. For example, what data is generated in one year now is equal to total data generated in 5000 years back. This makes sense that what data is collected today is way less for the data to be generated in coming two to three years. AI works completely on data analysis, bigger the volume of data more accuracy of results. My happiness is that AI is going to help a lot to internet marketers to save their time. Research from Callcredit shows that 96% of senior marketers waste an average of five hours and 36 minutes every week trying to improve their data analysis processes. Content creation and content delivery will not be any more harsh. Personalized content will win the hearts.